I am a baseball fan. I was a baseball fan when I was a kid and I still am today (with a short hiatus in the middle). I have seen a bunch of Mets games at Shea stadium in the last few years, and I usually have the kind of seats that you would expect a casual fan to have. When you're talking about a contending team like the Mets, that translates to "the nose bleeds". So last season, I decided to splurge. I figured that I would only be going to one game for the whole season, so I bought tickets second hand, paid an arm and a leg, and wound up with the best baseball seats that I have ever had. I don't know if I would ever pay that much for tickets again, but it definitely got me some good photo ops. 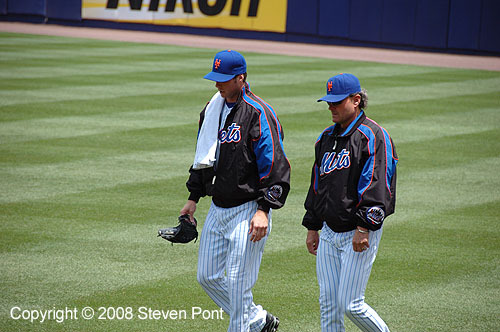 This is pitcher John Maine and pitching coach Rick Peterson walking in from the bullpen to start the game.